Flora : There are different kinds of flora's in this national park. This forest has over 600 species. Some species are Gmelina arborea, Michelia champaca, Hollock, Nahor, Ajar Amari, Urium poma, Bhelou, Agaru, Rudraksha, Bonjolokia, Hatipolia akhakan etc. Fauna : There are different species of fauna's in this national park. There are more than 30 species of Mammals in this park. Some are Tiger, Leopard, Black Panther, Clouded Leopard, Lesse Cats, Sloth Bear, Himalayan Black Bear, Elephant, Indian Bison, Dhole, Sambar, Barking Deer, Dog Deer etc. Reptiles are King cobra, cobra, Pit Viper, Russels Viper, Banded Krait, Python, Rat Snake, Assam Roof Turtle, Malayan Box Turtle, Keeled Box turtle, Asian Leaf Turtle etc. Birds are White winged wood duck, Great Pied Hornbill, Wreathed Hornbill, Rufous Necked Hornbill, Black Stork, Ibis Bill, Large Whistling Teal, Common Mergernser, King Vulture, Long Billed Ring Plover etc. 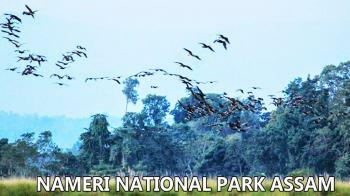 The timing of Nameri National Park is from 5:00 AM - 7:00 PM. The time to visit in Nameri National Park is from November to March. In Winter : The temperature in winter is 12 degree Celsius to 21 degree Celsius. By Air : The nearest airport is located in Tezpur. The distance of this airport is 37 km from Nameri National Park. By Rail : Rangapara railway station is the nearest railway station. The distance of this railway station is 25 km from Nameri National Park. By Road : Nameri National Park is well-connect to all major cities.